Bangkok, March 07, 2013 – On the constant lookout for new opportunities anytime and at anyplace, Thai workers are fast becoming a nation of ‘change seekers’ rather than just jobseekers. This is especially so in this increasingly connected world resulting from the rapid growth of mobile communications. A recent Asia-wide survey study commissioned by leading online jobs portal, jobsDB.com, has revealed that both men and women in their economically-active years across all age groups are constantly on the lookout for new career opportunities, even if they have just started a new job, or are already settled in their current job. Conducted in six different markets in Asia, namely Hong Kong, Indonesia, Malaysia, the Philippines, Singapore and Thailand, the focus group study allows jobsDB to gain a better understanding on the behaviour of the Asian jobseekers. Information gathered from the study was further validated by the Asian Consumer Market Survey done in October 2012, which shows that 35 per cent of Thai are actively searching for a new job 48 per cent of those surveyed also mentioned that they are exploring, which means that while they are not actively looking, they would still apply for a job if the right opportunity comes along. To facilitate this new ‘mobile’ trend, Thai jobseekers stay connected around-the-clock, updating their CVs through online portals and opting to receive alerts via their mobile devices or email, according to the jobsDB survey results. Statistics obtained from mobile site visits also indicated that the number of jobseekers in Thailand using mobile devices to access opportunities on the jobsDB portal has risen dramatically by 300 per cent from January 2011 to January 2013. “I guess we should not be too surprised that the mobile revolution has extended rapidly into the working lives of young Asians. In many ways it reflects the vibrant, growing economies of the countries surveyed,” said Mr. Adrian Chng, Chief Executive Officer of jobsDB group. In view of this trend towards mobile usage for seeking new jobs, jobsDB has rebranded its website, mobile site and mobile app to cater to the changing mindsets of users. Leveraging on the business expertise by new partner SEEK, jobsDB will be launching a series of product innovations that is refreshed to create a more personalised touch with users. The website, mobile site and app will be rebranded and become cleaner and more structured, making it easier for jobseekers to search through the different job postings. “jobsDB will stand for something bigger than just being an ordinary job portal. Users who go to our website will be able to search for career advice and tips on how to allow themselves to stand out among other jobseekers. They are able to sign up for career events through the jobsDB portal. 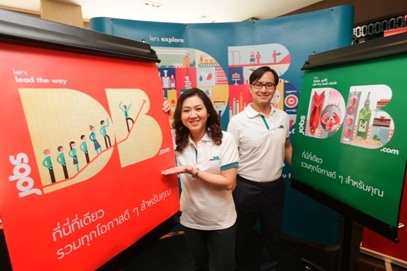 This is in line with the creative platform, ‘Let’s explore,’ which is an open invitation for job seekers, or change seekers, to take action and fulfill their true potential through jobsDB,” states Ms. Noppawan Chulakanista, Managing Director of jobsDB Thailand.